A new lawsuit alleges that PepsiCo misleadingly markets its Naked juices as if they contain mostly super nutritious ingredients like kale, blueberries, and acai berry when, really, the first ingredient in 16 of its juices is orange juice or apple juice. Hot tip: Legally, ingredients have to be listed in order of weight, so that means there’s more juice than puréed veggies or fruits. This doesn’t make the drinks unhealthy, but consumer-advocacy group Center for Science in the Public Interest (CSPI) says people think they’re getting high-value ingredients when they’re getting mostly cheap ones. It’s a bit of a bait and switch. CSPI filed the proposed class-action suit on behalf of plaintiffs who’d purchased Kale Blazer, Green Machine, and other drinks, and alleges that PepsiCo knew that people would pay more for certain healthy ingredients. Looking at Kale Blazer in particular, the front of the bottle does say “Kale flavored 8 juice blend” but oranges and apples are not shown alongside the greens. CSPI says that green imagery overwhelms the disclosure. Kale is king of the garden. And when its dark, leafy greens are blended with cucumber, spinach, celery, and a pinch of ginger, you get a royal round table of yum that will help you take charge and rule the day. Long live the greens. The suit seeks for Pepsi to award damages to people who bought the juices as well as to adjust its marketing. PepsiCo told Consumerist in a statement that the suit is “baseless” and that the products are not misleading. 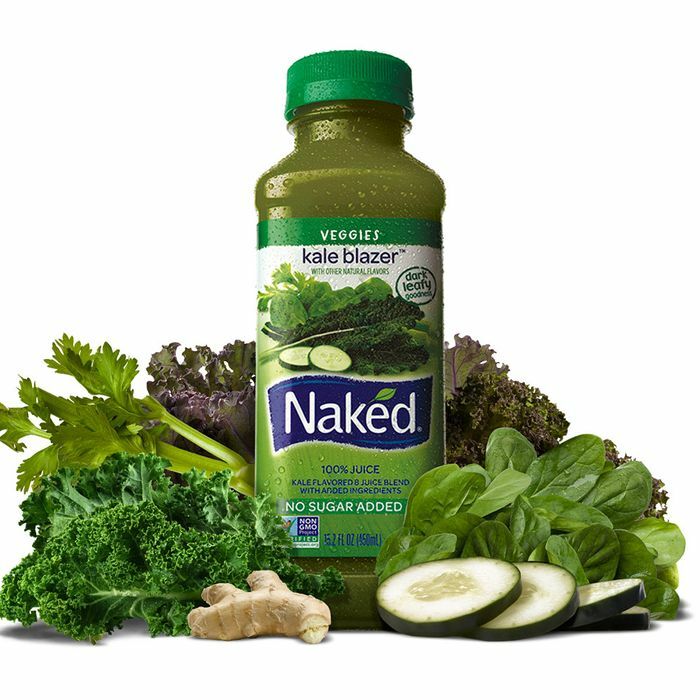 “Every bottle of Naked Juice clearly identifies the fruit and vegetables that are within,” per the statement, including the 5 and 3/4 leaves of kale in each 15.2-ounce bottle of Kale Blazer. CSPI also takes issue with the drinks’ “no sugar added” claim, which suggests that they are low in sugar, but that’s a bit of a stretch. Naked Juices contain between 34 grams to 61 grams of sugar per bottle and it’s more likely that PepsiCo is simply telling people “don’t freak out, it’s natural sugar from fruit.” Transparency about added sugar is a good thing.